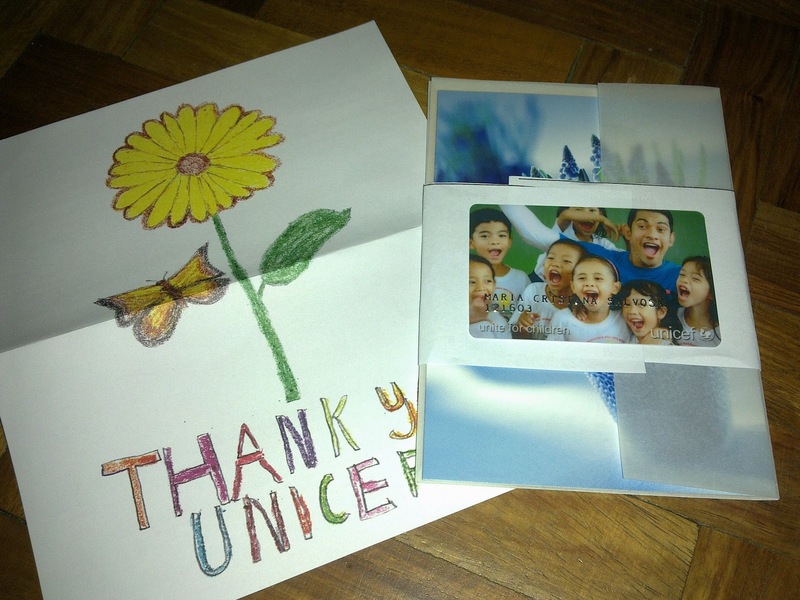 My very own donor/discount card from Unicef, together with a couple of greeting cards! Yey! I actually became a Unicef donor about two years ago, after I was sales – “talked” into donating a small amount. It didn’t really take much as I had always wanted to do charity work (except that I still obviously need to earn) and I have a soft spot for kids (well, I also have a soft spot for old folks) so I knew I was going to sign up even before the girl walked up to me. And, knowing how tamad I am, I opted to have it charged to my credit card every month – that way, I won’t even notice it and I won’t miss a single month. It’s a very small amount but I know that combined with others, it can and will change the life of children somewhere. I know I have generous friends reading this so you might want to check out http://www.unicef.org/philippines or call 758-1000. On a side note, Ipe and I decided to revive an old family tradition of ours – giving gifts/food on Christmas eve. I last did this with my folks three years ago and never got around to doing it again. So last December 24th, I hurried home from the office, and after some last minute grocery/shopping and confession at Greenbelt, proceeded to cook spaghetti for thirty people. Since we also have quite a couple of balls of ham, we decided to make ham sandwiches with egg and cheese and put them in styro containers. I can’t tell you how good it feels to see those poor people coming up to our car as we distributed the food. I almost cried that we didn’t have enough to feed all of them – after all, we only managed to give out 30 packs (and even forgot to buy fruit juices to go with it) and there were just too many hungry souls on Christmas Eve. awww that was really nice of you. it really feels good to be able to help out. yeah, i was fighting back tears while giving out the styro. and you know, the funny thing was, they didn't fight with one another to get to our car. they were very civilized and polite and just quietly turned away when our packs ran out.